Today, I received a beautiful swap gift from Ana! 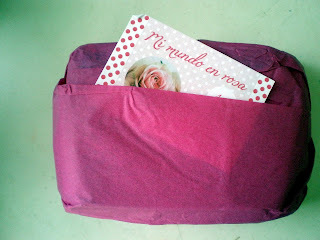 I love Ana's gorgeous blog Mi Mundo En Rosa. 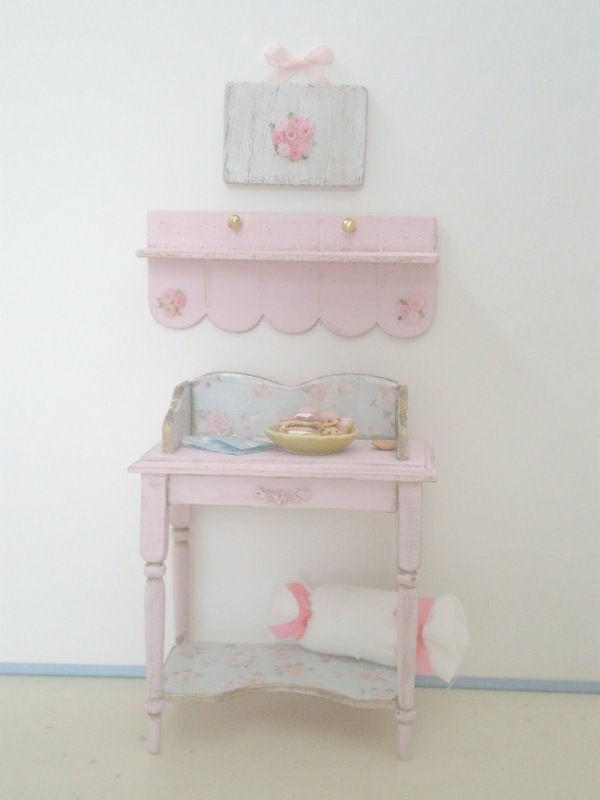 And she also has an Etsy shop filled with delightful minis called Mundo Rosa. She sent me a gorgeous pink table with light blue paper trimming it. It is such a soft beautiful palette. She made yummies! A whole plate full of cookies, eclairs, chocolate chip cookies, heart cookies and macarons!! With 2 napkins to keep everyone clean! 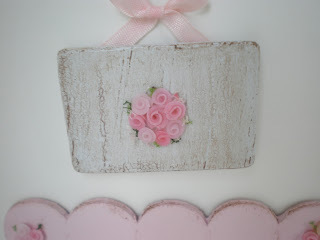 This little rose plaque all shabby chic! 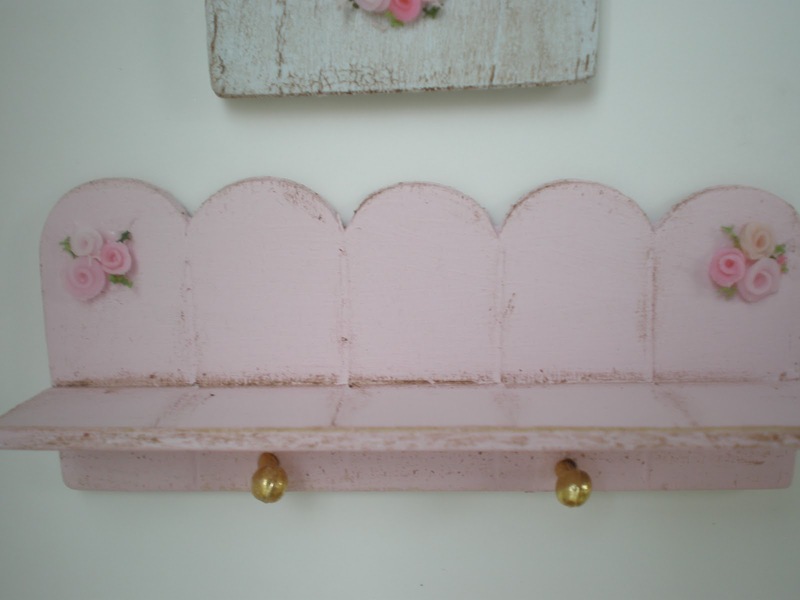 An adorable shelf with roses and gold hooks. 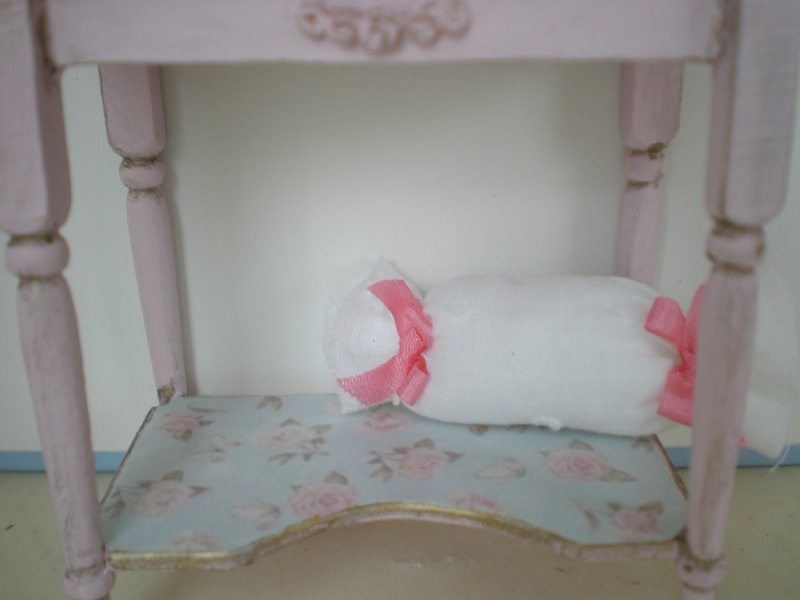 A beautiful bolster pillow with pink bows to match everything. Thank you Ana! I will cherish this truly stunning little masterpiece. 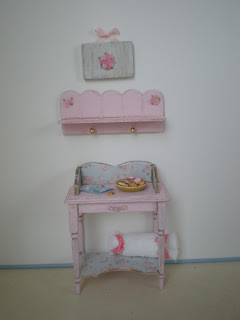 I think you will see it with my dolls in upcoming pictures. It so precious! of goodies, just too cute. Lovely gift, Caroline. 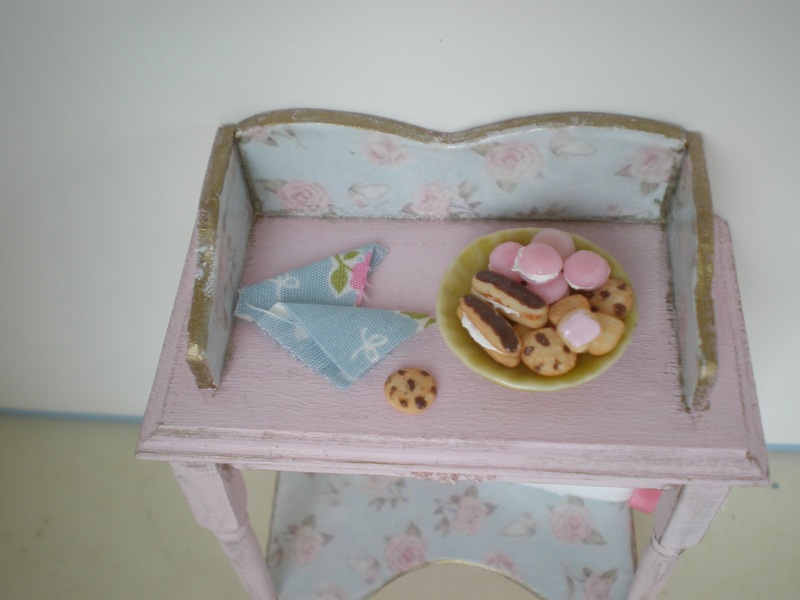 All the pieces are so sweet and that plate of pastries looks delicious! It's a gorgeous gift. 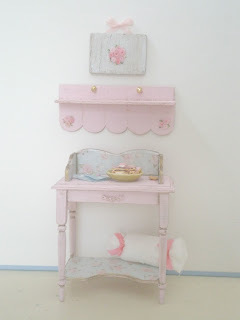 I think it will be perfect in one of your houses. Fantastic gifts! I love Ana's gorgeous work and I love following her blog. Enjoy your treasures. Hello Caroline, lucky you ;)! You recieved some lovely gifts from Ana. Thank you for haring the link of her blog. 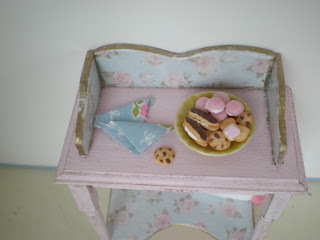 I love Ana's work, and the gift she's made for you is beautiful.I love the colours and the little plate of sweets looks delicious!! I can't wait to see what you've made for Ana. Great swap, Caroline! It's beautiful! Congratulations on your beautiful gifts. 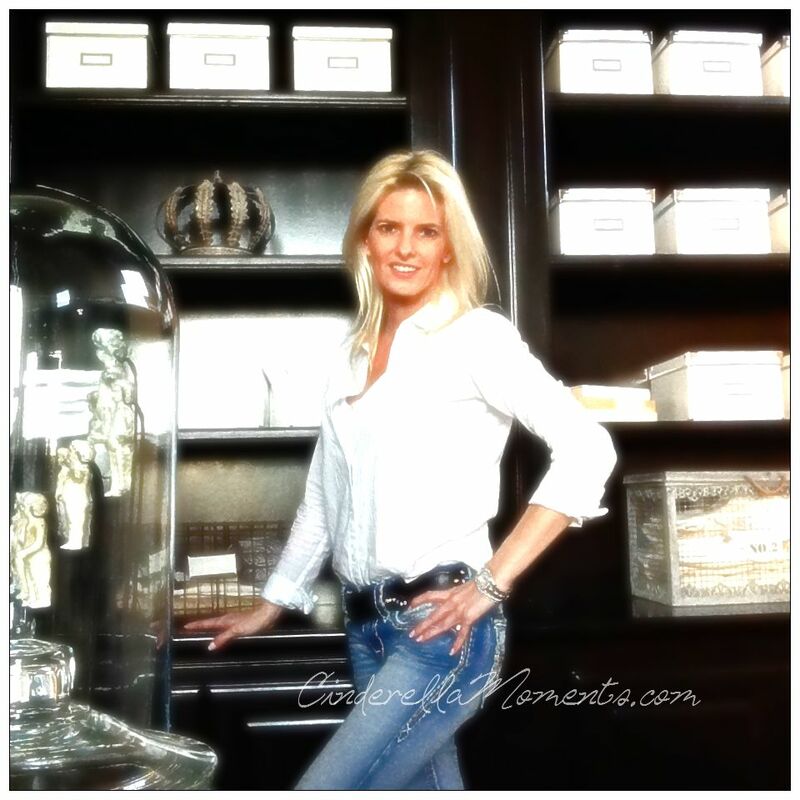 Enjoy these wonderful treasures. Enhorabuena por esos preciosos regalos de Ana, hace verdaderas maravillas y es un cielo de persona. The gifts Ana made for you are sooo wonderful! Enhorabuena por esos bonitos regalos. Saludos. Oh yes, totally yummy goodies! I love the blue floral paper she trims the table with. Wow this is so beautiful, I love Ana's work! First, apologize for answering so late. Thanks so much for this post and words addressed to me. I'm glad that you like and you know me well, I love your work! has been a pleasure to do this exchange with you. Thanks! My First Book and The 4th of July Dollhouse!